Yelp on Thursday reported a 70% surge in revenue from a year ago to $70.7 million in the fourth quarter, while narrowing its losses. The local ratings and reviews service posted a loss of $2.1 million, or three cents a share, compared to a loss of $5.3 million, or 8 cents a year ago. Wall Street analysts, on average, had expected Yelp to report a loss of five cents on revenue of $67.2 million. 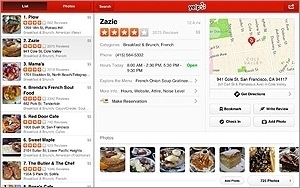 Yelp continued to see a continuing shift of usage to mobile devices, with 53 million mobile unique visitors each month across its mobile site and apps. Since Yelp gave users the ability to post reviews via mobile last August, 30% of new reviews have come from handheld devices, the company said Thursday. Cumulative reviews overall increased 47% last year to 53 million, enhancing its depth of user-generated content. In terms of e-commerce, Yelp is now getting 10,000 food orders a week after introducing the ability to order directly from eateries last summer. Active local business accounts for Yelp, or the total of businesses that advertise with the local ratings and review service, rose 69% to about 67,000 in the quarter from a year ago. On the consumer side, it had about 120 million monthly active users globally, up 39% from a year earlier. Those growth rates compare to 61% for business accounts, and 41% for users, in the prior quarter. Analysts believe Yelp still has plenty of room to grow among local businesses. In its 2014 “Nothing but ‘Net” report, JPMorgan estimated the potential market for the company is about five million local businesses. And with 69 active business accounts at the end of 2013, it still has less than 1% of the addressable market, according to the study. On the international front, Yelp said with recent expansion to New Zealand, the Czech Republic, Brazil and Portugal last year, the service is now available in 24 countries. Through the integration of Qype, acquired in 2103, it has added 1.8 million reviews and 1.4 million photos from the local review site’s Germany-based service. With the expansion of its European sales efforts, Yelp is now selling advertising across France, Spain and Germany. For the current quarter, Yelp projects revenue in the range of $73.5 million to $74.5 million, representing 60% from the year-earlier period. After closing at $75.23 on Thursday, Yelp shares rose about 4% in after-hours trading following its earnings announcement.